Five new Apex Series 3-CMOS R-G-B area scan cameras announced. Provides 3.2-megapixel and 1.6 megapixel options with GigE Vision, USB3 Vision, or Camera Link interfaces. This full range of features and functions are making it easier than ever before for machine vision designers to consider the advantages of 3-sensor prism technology for their next generation of color inspection systems. Like the original AP-3200T-USB, these models feature the Sony PregiusTM IMX265 1/1.8" CMOS imager with 3.45 micron pixels at a resolution of 2048 x 1544. These models feature the Sony PregiusTM IMX273 1/2.9" CMOS imager with 3.45 micron pixels at a resolution of 1456 x 1088. In nature, no one handles color better than the chameleon. And for color vision systems, no industrial cameras handle color better than the Apex Series. With their new 3-CMOS, prism-based technology, these Apex cameras provide significantly higher color accuracy and spatial precision than typical Bayer-filter cameras. All of the new Apex Series cameras are loaded with a range of advanced feature sets supporting the most challenging color imaging applications. The color space conversion tool provides great flexibility in on-board color space conversion: including RGB to HSI color space conversion and RGB to CIE-XYZ color space conversion. (sRGB and Adobe RGB color spaces are also supported). 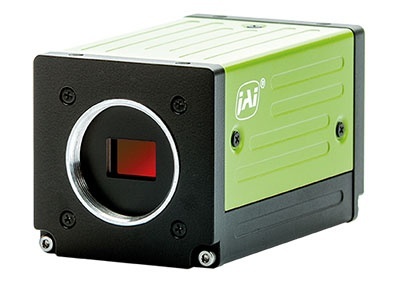 The new cameras utilize a new prism design making it more than 50 percent smaller and nearly 50 percent lighter than JAI’s previous 3CCD models, despite having much higher resolution. The camera is robustly built with a 50G shock rating and 3G vibration rating which, combined with an operating temperature range of -5°C to +45°C (ambient), enables the cameras to operate reliably in a wide range of industrial environments.